Does this collar look scary to you? If the answer is yes, this blog is for you my dear. I was first introduced to this collar by a client's trainer. My reaction was similar to yours until he showed me how it works. Ever since then I have recommended it to several clients and it has worked wonders. One example, you all know how strong Frenchies are, right? He was ok on leash, he still pulled a bit and if he wanted to go somewhere, I was dragged along, until.... Yes you guessed it!!! With my client's permission, I tried it on the dog. It was like a miracle, within minutes he was walking on loose leash. One day I was walking him in the park, a guy asked me if I was a dog trainer! 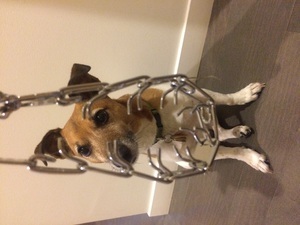 There are many people who are opposed to using this collar, they believe it is cruel. It isn't, it puts pressure around the entire neck, kind of like a mother grabbing the pups' scruff to correct his behavior. Do not confuse this collar with the choke collar which chokes the dog and is very dangerous. You never want to pull on it with all your might, simply check it lightly a few times to correct the behavior. Also only use this collar when walking your dog. Never leave it on during play dates or at home. So if you are having problems getting your dog to walk on loose leash even after taking him to training classes, why not check it out. You can find a number of YouTube videos that will show you how to use it properly. I'm not a dog trainer. Just wanted to share my experience with you. This is the only brand I'd recommend. Please see link below.